Radiotherapy is an integral part of various therapeutic regimens in pediatric and adult oncology. Endocrine dysfunction, neurologic and psychiatric deficits, secondary malignancies and radiation-induced necrosis are well-known possible late effects of cranial irradiation. However, only sporadic cases of radiation-induced cavernous hemangiomas (RICH) have been reported so far. Pediatric patients who underwent cranial radiation therapy for malignant diseases between January 1980 and December 2003 were retrospectively analyzed. After the end of therapy they entered a detailed follow-up program. Of 171 patients, eight (three patients with medulloblastoma, three patients with acute lymphoblastic leukemia, and one patient each with ependymoma and craniopharyngioma) developed intracerebral cavernoma 2.9–18.4 years after irradiation representing a cumulative incidence (according to the Kaplan-Meier method) of 2.24%, 3.86%, 4.95%, and 6.74% within 5, 10, 15, and 20 years following radiation therapy, respectively. In patients treated in the first 10 years of life, RICH occurred with shorter latency and significantly more often (p = 0.044) resulting in an even higher cumulative incidence. These findings and previously published cases show that cavernous hemangiomas may occur after irradiation of the brain several years after the end of therapy irrespective of the radiation dose and type of malignancy. Particularly children < 10 years of age at the time of irradiation are at higher risk. Since patients with RICH frequently do not show symptoms but hemorrhage is a possible severe complication, imaging of the central nervous system should be performed routinely for longer follow- ups, particularly in patients who were treated as young children. Strahlentherapie ist ein wichtiger Bestandteil bei der onkologischen Behandlung pädiatrischer sowie erwachsener Patienten. Endokrine Dysfunktion, neurologische und psychiatrische Defizite, Sekundärmalignome und strahleninduzierte Nekrosen sind bekannte Spätfolgen nach kranieller Bestrahlung. Das Auftreten strahleninduzierter kavernöser Hämangiome (Kavernome) ist bisher nur vereinzelt beschrieben worden. Es wurden alle pädiatrischen Patienten, die an der eigenen Abteilung zwischen Januar 1980 und Dezember 2003 aufgrund unterschiedlicher maligner Erkrankungen einer Schädelbestrahlung unterzogen und danach in ein umfassendes Nachsorgeprogramm eingeschleust wurden, retrospektiv analysiert. Von 171 Patienten entwickelten acht (drei Patienten mit Medulloblastom, drei Patienten mit akuter lymphatischer Leukämie und je ein Patient mit Ependymom und Kraniopharyngeom) 2,9–18,4 Jahre nach der Strahlentherapie intrazerebrale Kavernome (s. Tabelle 1). Nach der Kaplan-Meier-Methode entspricht dies einer kumulativen Inzidenz von 2,24%, 3,86%, 4,95% bzw. 6,74% innerhalb von 5, 10, 15 bzw. 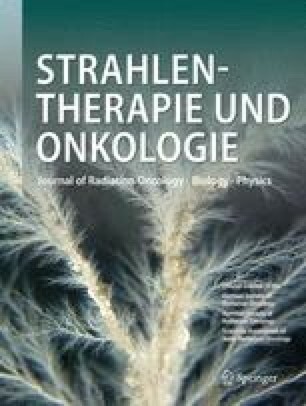 20 Jahren nach Strahlentherapie (s. Abbildung 1). Bei Patienten, welche in den ersten 10 Lebensjahren behandelt wurden, traten Kavernome mit kürzerer Latenzzeit und häufiger (p = 0,044) auf (s. Abbildung 2). Diese Ergebnisse und die bisher veröffentlichten Daten zeigen, dass Kavernome – unabhängig von der Art der Grunderkrankung und der Strahlendosis – auch viele Jahre nach kranieller Bestrahlung auftreten können. Kinder < 10 Jahre haben ein höheres Risiko, eine solche Gefäßmalformation zu entwickeln. Da Patienten mit Kavernomen häufig keine Symptome zeigen diagund Blutungen mögliche schwere Komplikationen darstellen, sollte eine regelmäßige Bildgebung des Neurokraniums im Rahmen der Nachsorge auch noch viele Jahre nach Therapieende durchgeführt werden.